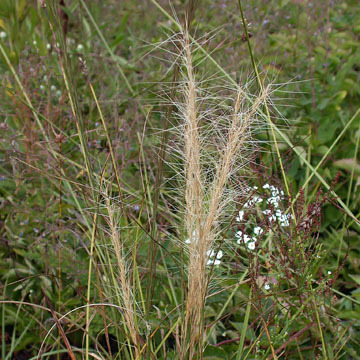 Aristida purpurascens (Arrowfeather Threeawn) | Plants of the Northeastern U.S.
Dry sandy soil and prairies. MA to southern Ontario, WI, and KS, south to FL and TX. Herbaceous perennial; culms 40-100 cm, tufted on a knotty base; leaves to 20 cm, mostly flat, 1-4 mm wide; lower sheaths covering the nodes, usually more or less pilose; inflorescence 10-20 cm, slender, loosely or densely spike-like, with short, ascending or appressed branches; glumes 1-veined, the first 8-14 mm, scabrous on the keel and sometimes on the sides, the second 6.5-11.5 mm, almost always exceeding the lemma and exceeded by the first glume; lemma 5.5-9.5 mm; awns about equally divergent, the central one 2-3.5 cm, the lateral 1.5-2.5 cm. Photographed in a sand prairie in northwest Ohio.